Last Friday I was invited along with some of the other Bournemouth Bloggers to an event with The Body Shop. We had been to an event with them the month before which I really enjoyed, so I was very much looking forward to this one especially as it was a chance for the store to showcase their Christmas range. On the night it was absolutely pouring with rain and so windy and it was a little bit of a mission to get to the store but myself, my sister and her friend made it and were greeted with prosecco and a warm welcome from the assistant manager Hannah and her colleagues at the Bournemouth branch. We were soon joined by everybody else and Hannah talked us through the evening as well as introducing the Christmas range of products to us. I fell in love immediately with the shimmer mist, it was so sparkly and left a lovely subtle shimmer which smelt gorgeous and lasted the rest of the evening. I also really liked the Peppermint Candy Cane range, although most of the others preferred the Berry Bon Bon and Vanilla Marshmallow ranges. I think it is definitely a strong scent but I love how fresh it smells. I couldn’t stop sniffing the body butter and loved having a mini hand massage during the event with the hand cream. 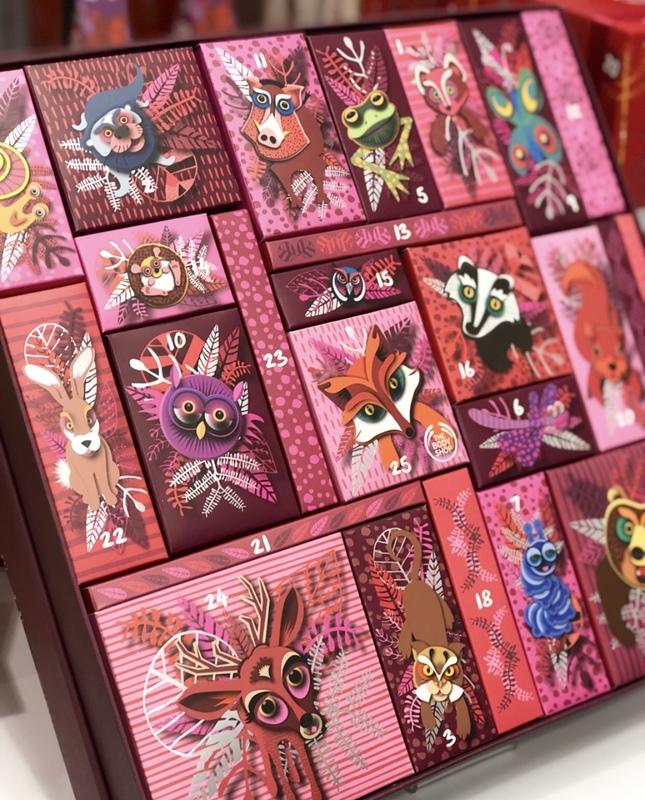 As well as their seasonal scents, The Body Shop also have a fantastic range of gifts as well as festive products such as the totally adorable headbands. I picked up the reindeer set which comes with 6 face masks as well as the headband and would be a lovely stocking filler or secret Santa gift. My sister totally rocked the racoon headband on the night! I had stocked up on a lot of skincare during the last event so I headed over to the makeup this time. My sister had a little makeover sampling the foundations to find the best shade and I decided to choose 4 of the eyeshadow shades to make my own palette – such a good idea as there is always that one shade in a palette that I never use as it doesn’t suit me! I was a little gutted to discover they didn’t have my favourite shade from the testers in stock but I am happy with the palette I put together. We were able to take advantage of a special 40% discount on core items and 25% discount on gift sets during the event and I came away really pleased with my purchases that hadn’t broken the bank. I even received a free shower gel of my choice as I spent over £25 on the night. I cannot fault The Body Shop for their customer service, the staff are always so friendly and happy to help and their knowledge and passion for the brand is clear. Their festive range is fantastic and I recommend a visit to your local branch or head online to take a browse of the range on their website. I was invited along to this event with the Bournemouth Bloggers however all words and images are my own.